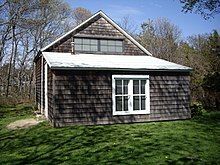 Jackson's Pollock's barn /studio in Springs, N.Y.
Paul Jackson Pollock (January 28, 1912 – August 11, 1956) was an influential American painter and one of the leading artists in the Abstract Expressionist movement in the 1950's. As to what I would like to be. It is difficult to say. An Artist of some kind. If nothing else I shall always study the Arts. People have always frightened and bored me, consequently I have been within my own shell and have not accomplished anything materially. I believe easel painting to be a dying form, and the tendency of modern feeling is toward the wall picture or mural..
My painting does not come from the easel. I hardly ever stretch my canvas before painting. I prefer to tack the unstretched canvas to the hard wall or the floor. I need the resistance of a hard surface. On the floor I am more at ease. I feel nearer, more a part of the painting, since this way I can walk around it, work from the four sides and literally be in the painting. This is akin to the method of the Indian sand painters of the West. When I am in my painting, I am not aware of what I'm doing. It is only after a short of 'get acquainted' period that I see what I have been about. I have no fears about making changes, destroying the image, etc., because the painting has a life of its own. I try to let it come through. It is only when I lose contact with the painting that the result is a mess. Otherwise there is pure harmony, an easy give and take, and the painting comes out well. Pollock wrote this text on the back of a photo of himself taken in his own studio. I can control the flow of paint; there is no accident.. I accept the fact that the important painting of the last hundred years was done in France. American painters have generally missed the point of modern painting from beginning to end.. .Thus the fact that good European moderns [European artists who lived in the U.S. because of the Nazi-regime] are now here is very important, for they bring with them an understanding of the problems of modern painting. I am particularly impressed with their concept of the source of art being the unconscious. These idea interests me more than these specific artists do, for the two artists I admire most, Picasso and Joan Miró, are still abroad. The idea of an isolated American painting, so popular in this country during the thirties, seems absurd to me, just as the idea of a purely American mathematics or physics would seem absurd.. .And in another sense, the problem doesn't exist at all; or, if it did, would solve itself: An American is an American and his painting would naturally be qualified by the fact, whether he wills or not. But the basic problems of contemporary painting are independent of any one country. I have a definite feeling for the West, the vast horizontality of the land, for instance.. .I have always been very impressed with the plastic qualities of American Indian art. The Indians have the true painter's approach in their capacity to get hold of appropriate images, and in their understanding of what constitutes painterly subject-matter. Their colour is essentially Western, their vision has the basic universality of all real art. Some people find references to American Indian art and calligraphy in parts of my pictures. That wasn't intentional; probably [it] was the result of early memories and enthusiasm. Abstract painting is abstract. It confronts you. There was a reviewer a while back who wrote that my pictures didn't have any beginning or any end. He didn't meant it as a compliment, but it was. It was a fine compliment. Only he didn't know it. I've had a period of drawing on canvas in black – with some of my early images coming thru -, think the non-objectivists will find them disturbing – and the kids who think it simple to splash a 'Pollock' out. The thing that interests me is that today painters do not have to go to a subject-matter outside themselves. Modern painters work in a different way. They work from within. I don't care for 'Abstract expressionism'.. ..and it is certainly not 'non-objective', and not 'non-representational' either. I'm very representational some of the time, and a little all of the time. But when you're painting out of your consciousness, figures are bound to emerge. We're all of us influenced by Freud, I guess. I've been a Jungian for a long time.. .Painting is a state of being.. .Painting is self-discovery. Every good artist paints what he is. I think they [the public] should not look for, but look passively — and try to receive what the painting has to offer and not bring a subject matter or preconceived idea of what they are to be looking for.. .and I think the unconsciousness drives do mean a lot in looking at paintings.. .I think it should enjoyed just as music is enjoyed — after a while you may like it or you may not. But it doesn't seem to be too serious. I like some flowers, and others, other flowers I don't like. I think at least it gives — at least give it a chance. The modern artist is living in a mechanical age and we have a mechanical means of representing objects in nature such as the camera and photograph. The modern artist, it seems to me, is working and expressing an inner world – in other words – expressing the energy, the motion and the other inner forces.. ..the modern artist is working with space and time, and expressing his feelings rather than illustrating. Modern art to me is nothing more than the expression of contemporary aims of the age we're living in.. .All cultures have had means and techniques of expressing their immediate aims – the Chinese, the Renaissance, all cultures. The thing that interests me is that today painters do not have to go to a subject matter outside of themselves. Most modern painters work from a different source, they work from within. Well, method is, it seems to me, a natural growth out of a need, and from a need the modern artist has found new ways of expressing the world about him. I happen to find ways that are different from the usual techniques, which seems a little strange at the moment, but I don't think there's anything very different about it. I paint on the floor and this isn't unusual – the Orientals did that. Most of the paint I use is a liquid, flowing kind of paint. The brushes I use are more a sticks rather than brushes – the brush doesn't touch the surface on the canvas, it's just above.. ..[so] I am able to be more free and to have greater freedom and move about the canvas, with greater ease. With experience it seems to be possible to control the flow of paint, to a great extent, and I don't use – I don't use the accident – 'cause I deny the accident.. ..it's quite different from working, say, from a still life where you set up objects and work directly from them. I do have a general notion of what I'm about and what the results will be. I approach painting in the same sense as one approaches drawing, that is, it's direct. I don't work from drawings and colour sketches into a final painting. Painting, I think, today – the more immediate, the more direct – the greater the possibilities of making a direct – of making a statement. Naturally, the result is the thing [in painting] and it doesnvery vibrantt make much difference how the paint is put on as long as something has been said. Technique is just a means of arriving at a statement. Attributed by Lee Krasner (1964) in "Oral history interview with Lee Krasner, 1964 Nov. 2-1968 Apr. 11", interview with Dorothy Seckler for the Smithsonian Institution Archives of American Art. Each age finds its own technique.. .I mean, the strangeness will wear off and I think we will discover the deeper meanings in modern art. My concern is with the rhythms of nature.. .I work inside out, like nature. He [Pollock] has broken the ice. Jackson Pollock.. ..left us [c. 1958] at the point where we must be preoccupied with and even dazzled by the space and objects of our everyday life, either our bodies, clothes, rooms, or, if need be, the vastness of Forty-Second Street [New York].. ..Objects of every sorts are materials for the new art, paints, chairs, food, electric and neon-lights, smoke, water, old socks, a dog, movies, a thousand other things which will be discovered by the present generation of artists.. ..All will become materials for this new concrete art. When Jackson talked about painting he didn't usurp anything that wasn't himself. He didn't want to change anything, he wasn't using any outworn attitude about it, he was always himself. He just wanted to be in it because he loved it. The response in the person's mind to that mysterious thing that has happened before has nothing to do with 'who did it first'. Certainly I know that he [Jackson] did see the Indians doing sand paintings. You know, that's a fact. But I don't know why he chose to work on the floor. All I can say is that he did.. .He would never have said, 'That's why I am working on the floor, because I saw the Indians' sand painting.'. But I've heard him say that he did see the Indians' sand painting. I think by now that's been established. I wouldn't know why he worked on the floor, but obviously that was the way he worked. And that's that!.. .No, I didn't work on the floor. There is a painting called 'Prophecy' which I did just before I left for Europe. Every time the work broke, it sent me into a tailspin because I couldn’t tell what was happening. I asked Jackson to come and look at this painting and he did and said I needn't be nervous about it. He thought it was a good painting and the only thing that he objected to was this image in the upper right hand which I had scratched in with the back of a brush. It made a kind of an eye form. He advised me to take it out. I said that I didn't agree with him and left it in.. ..it is the change that I had to get used to and accept. It frightened me.. ..it frightened me, particularly because it happened just before I left for Europe. Jackson looked at it, said what he said, and I went off to Europe. Jackson was killed in the automobile accident [Aug. 1956] while I was there and when I came back I had to confront myself with this painting before I was able to start again.. The first Pollock show I saw was in 1951 at Betty Parson's gallery, early in the fall, probably September or October. It was staggering. I really felt surrounded. I went with Clement Greenberg [famous art-critic of American Abstract Expressionism / New York School] who threw me into the room and seemed to say 'swim'. By then I had been exposed to enough of it so it hit me and had magic but didn't puzzle me to the point of stopping my feelings. 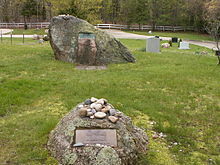 I went out to Springs and saw Pollock and his work, not only the shows [Frankenthaler frequently visited Pollock, and his wife Lee Krasner ]. In 1951 I looked at de Kooning as much as at Pollock.. ..but these came after all the [her] Cubist training and exercise. It all combined to push me on. Like Cubism.. ..I felt many more possibilities in Pollock's work. That is, I looked.. ..and was influenced by both Pollock and De Kooning and eventually felt that there were many more possibilities for me out of the Pollock vocabulary.. .de Kooning made enclosed linear shapes and 'applied' the brush. Pollock used shoulder and ropes and ignored the edges and the corner. I felt I could stretch more in the Pollock framework. I found that in Pollock I also responded to a certain Surreal element – the understated image that was really present: animals, thoughts, jungles, expressions. You could become a de Kooning disciple or satellite or mirror, but you could depart from Pollock. I think he [Pollock] could not relate to people. And was very depressed. And Lee [Krasner, Pollock's wife] really functioned beautifully as the mother who held him together, that he could be angry at, that he needed, that he could reject, who kept his particular sick syndrome going. 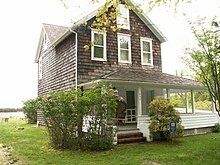 in East Hampton where Pollock lived .. ..if we [the couple then Helen Frankenthaler and Clement Greenberg arrived in mid-afternoon [for a weekend-stay with the Pollock's] the activity would be going out soberly, everyone, to look at Jackson's new pictures. He always had a very immaculate studio in that barn and would unroll one after another of what he'd been working on and each would walk around it on the floor and occasionally hold a picture up and talk about it. And then, say, if it was a Friday, we'd do the same thing with the same pictures Saturday. And then look again Sunday. And maybe something that didn't look good Friday afternoon had a double take on Sunday. I've always thought that with de Kooning you could assimilate and copy. 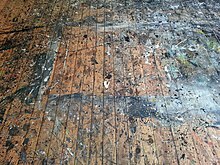 And that Pollock instead opened up what one's own inventiveness could take off from. In other words, given one's own talent for curiosity that you could explore, originate, discover from Pollock as one might, say, Picasso, or [Arshile] Gorky or [Wassily] Kandinsky in a way that de Kooning was a closed oeuvre. In the most positive sense [the impact of Jackson Pollock on Helen] I think it was a sense of being as open and free and surprised as possible, with a magic sense of -.. ..being able to know when to stop, when to labor, when to be puzzled, when to be satisfied, when to recognize beautiful or strange or ugly or clumsy, and to be free with what you are making that comes out of you.. ..I didn't paint new long canvases until I had seen his [Pollock] and I'm sure that Pollock's ambiance affected me tremendously. I was much more drawn to Pollock's painting on the raw canvas than I was to de Kooning's easel cuisine and there it's a matter of sensibility. Aesthetically, socially, in every way the de Kooning thing seemed to be much more productive, planned, admirable at the time [early 1950's]. But I didn't think so. I thought that Pollock was really the one living in nature much more than Bill [de Kooning]. Clem [= Clement Greenberg, her friend then] really recognized and appreciated Pollock's pictures and was one of the first artistic figures in New York to read them for their real value [c. 1950]. And Jackson appreciated, needed, and relied on this. I mean there were very few people around, very few dealers who were around, very few critics around, not very much that was positive. He [Pollock] is the one who would pull me out of a state when I would say, 'the work has changed and I can't stand it. It's just like so and so's work.' Then he would come [they lived and worked together] and look and say, 'You are crazy, It is nothing like so and so's work. Just continue painting and stop hanging yourself up.' We had that kind of rapport. He [Pollock] had an intuitive sense of rhythmical relations. He knew what counted.. .Even as an utter novice he never made anything ugly. His chief difficulty was with the basic art of drawing. To me, Pollock is the height of American painting. It's very lyrical. National Gallery of Art web feature on Pollock includes highlights of his career, numerous examples of the artist's work, photographs and motion footage of Pollock, plus an in-depth discussion of his 1950 painting Lavender Mist.